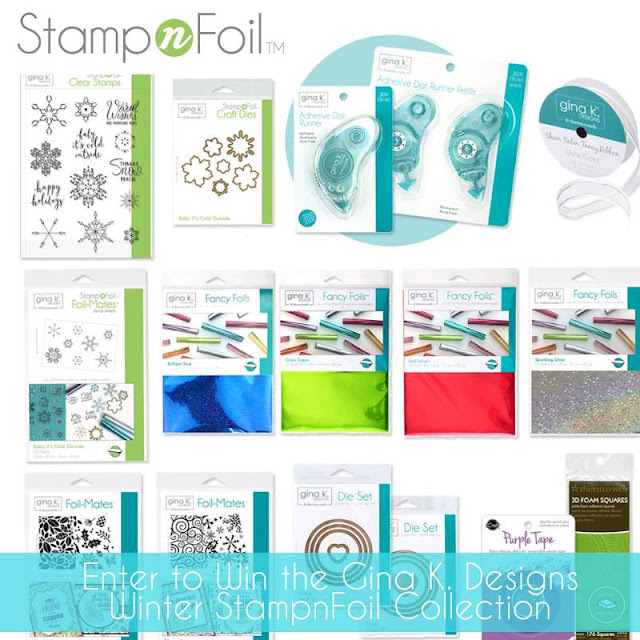 Hello friends and welcome to the Therm O Web & Gina K Designs Holiday Release Blog Hop! Today we're revealing 2 Brand New Limited Edition Stamp N Foil Sets, Foil-Mates and coordinating Die Sets. They are going to be perfect for creating some of the most elegant and easy Christmas cards ever! And to make this hop even more exciting, you have the chance to WIN 2 fabulous prizes! Make sure you check out all the details below. First up, I'm sharing a Christmas Card created using the Holly Jolly Stamp Set, Die Set and Foil Mates. I began by stamping the coordinating images onto the Foil-Mates using Gina K Designs Ink in Red Velvet and Jelly Bean Green. I then die cut them using the coordinating dies. I also stamped the pine branches onto White Cardstock and die cut them as well. Next, I foiled the poinsettias with Red Velvet Fancy Foil and the holly leaves with Jelly Bean Green Fancy Foil. To create the background, I used the striped design from the Ornamental Holiday Foil-Mates and foiled it using the Gold Sequins Fancy Foil. For the sentiment, I die cut a piece of white cardstock using the Gina K Designs Single Stitch Circle Die and then stamped "Holly Jolly" with Red Velvet Ink. I then layered all of the stamped images to create a cluster. I used the brand new Gina K Designs Dot Adhesive to adhere the pieces together and 3D Foam Squares to pop up some of the poinsettias. I finished the card by adding some enamel dots to the centers of the poinsettias. For this second card, I used the Baby It's Cold Outside Stamp Set, Die Set and Foil-Mates. I repeated the same process as the Holly Jolly Card but used a combination of Gina K Designs Powder Blue and Blue Denim ink pads. For the foil on the snowflakes I used Sparkling Silver Fancy Foils. To create the background, I used the swirled design from the Blizzard Backgrounds Foil-Mates and foiled it using the Sparkling Silver Fancy Foil. After I foiled the background, I ink blended Blue Denim onto the edges. The sentiment was then stamped onto a piece of white cardstock die cut using the Gina K Designs Single Stitched Rectangle Dies. I then finished off the card with a sheer ribbon bow. As I mentioned above, you have the chance to win 2 amazing prizes! First up is a HUGE prize package from Therm O Web that includes all of the products pictured below. This prize is worth over $200 and includes all of the new products along with a some other fabulous Gina K Designs products. For your chance to WIN this prize, head over to the Therm O Web blog and enter! The second prize you could win is pictured below. This prize is worth $150 and included the new Baby It's Cold Outside Stamp Set. For your chance to WIN this prize, simply LEAVE A COMMENT right here on my blog! Now it's time to hop and see what else the rest of the Therm O Web Designers have created using these new products. You are sure to be inspired as you hop along! And make sure to leave a comment on each blog for your chance to win! 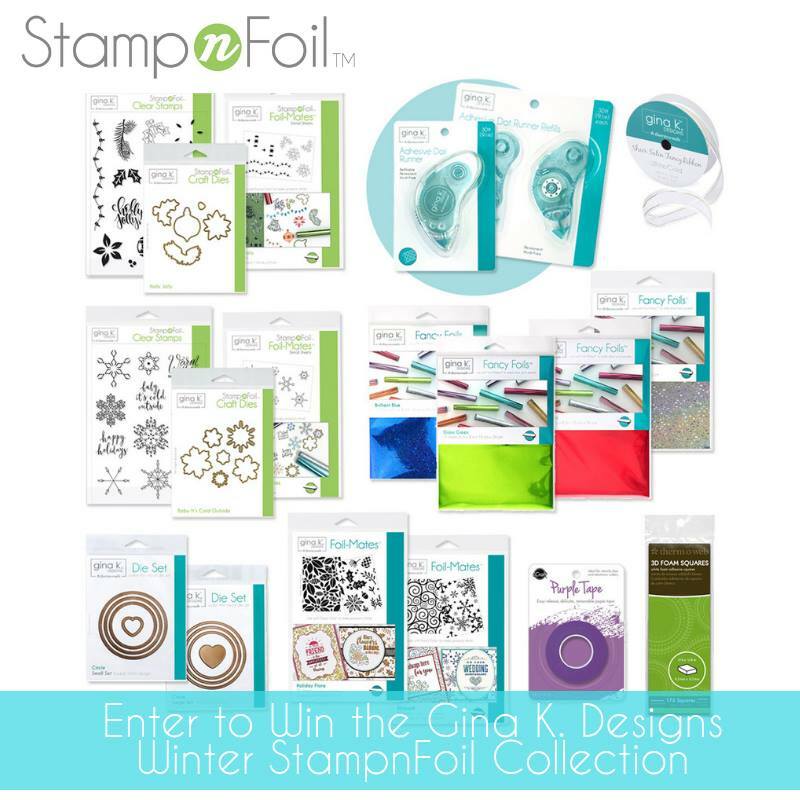 For even more inspiration and prizes head over to the Gina K Designs Blog! Affiliate links have been used and are at no extra cost to you. They allow me to keep providing you regular inspiration and content on my blog. Thank you so much for your support! I love your cards! Super fun! What amazing prizes. I love the beautiful foils and dies! I love these new cards. I have been obsessed with the Gina K. Foil-mates ever since my friend, Katrina, introduced them to me. 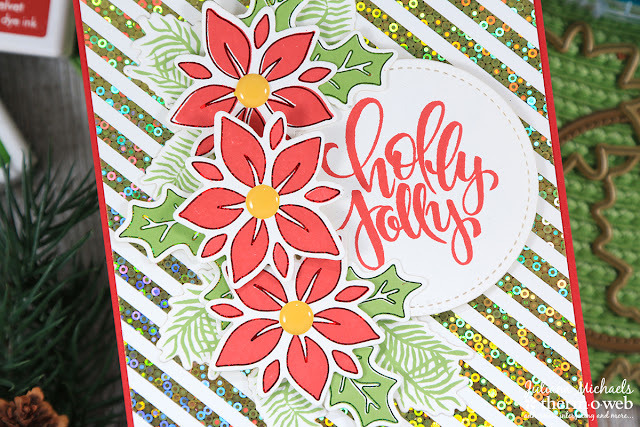 I like how the foil sparkles up your cards, and you've done a fantastic job on their creation, especially using stamp sets from Gina K's wonderful line of products. Love your cards and som many of GinaKs sets. Thank you for sharing! Both of your cards are very pretty but that second card, wow! Just beautiful! Both of your cards are so pretty Juliana! I can't wait to get these 2 new sets! Thanks for sharing!! Such cute cards! Love the snowflake card! Beautiful cards your 1st one catches my eye. Both are beautiful. Lovely cards, especially the snowflake one! Thanks for the inspiration! Such beautiful cards! Love Holly Jolly stamp set. Great release. Simply gorgeous cards! Love the background foiling on both! Simply stunning! I love the foiling backgrounds! The swirly background is great!!! Your cards are stunning!! I just love them! Gosh, your cards are gorgeous! Love these foil effects! Wow I love the font in the gorgeous velvet red and the gold sequin background is just bling bling haha. Really love both cards. Love your cards especially the backgrounds with all the sparkle and shine. I'm a sucker for stripes! I like the backgrounds on your festive and pretty cards. Love the backgrounds on both cards! BOTH of your cards are so pretty, Juliana!! better. Your cards are beautiful. Simply stunning cards! Loving this hop! Both cards are gorgeous! 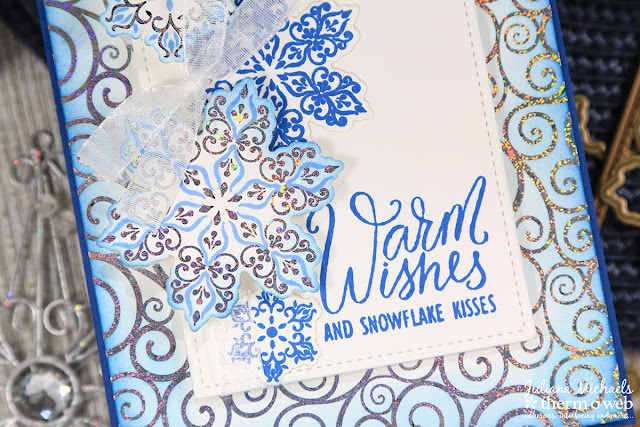 The shaded background on the snowflake card is so elegant, and the holly jolly card is bright and cheerful! Your cards are super. Love these sets. Both of these cards are beautiful!! Such a great release. I am enjoying all the beautiful projects everyone is posting. Some fantastic talent. I love Christmas!!! Gorgeous cards! Love all tat sparkle! The snowflakes are amazing with all the detail! Beautiful, elegant and festive cards! Fabulous layers and card designs. Nice focal image on the sparkly background! Snowflakes and foil makes me smile. Beautiful cards. Awesome products. I LUV this prize pack!! I DO have the purple tape & cannot wait to try it out..the tape runner looks cool!! Foiling!! Would LUV to win this!! Backgrounds are awesome...foiling is gonna make me go broke!! Like the stripped background on the Holly Jolly Card. The foil you used is great. I love the beautiful, sparkly backgrounds on these pretty cards! What beautiful cards. Baby It's Cold Outside is gorgeous with the different shades of blue. Thanks for the chance to win!